Purusottama month, or adhika masa (extra month) is also called mala masa (dirty month) by the performers of karma-kanda because they cannot get any material fruitive results from their worship during this month. Our acaryas say it is called mala masa because devotional activities performed in this month destroy the dirt and contamination caused by sins. It is called adhika (extra) masa because Sri Krsna has placed all His potencies, mercy, blessings in this month, and also because one gets more results from any pious act. Only works of devotion (Krsna-bhakti) give results in Purusottama month. 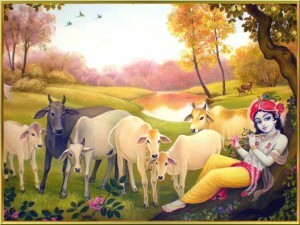 Of all months, Purusottama is Krsna’s favorite month. 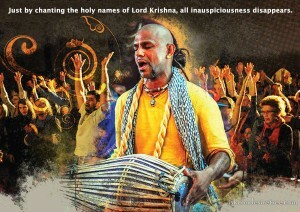 Lord Sri Krsna is Purusottama. As Krsna is the supreme among all incarnations, Purusottama is the supreme among all months. Purusottama month is the holiest month, far superior to the pious months of Magha, Vaisakha and Karttika. Purusottama month is worshiped all over the universe by devotees, sages, demigods and even Laksmi Devi Herself. If one sincerely worships Radha and Krsna in Purusottama month, he will attain everything. One who observes Purusottama vrata, will burn up the reactions of all his bad karma and attain the direct service of Radha and Krsna. Purusottama month is the best month for all spiritual advancement because Krsna overlooks all the aparadhas. Residence in the holy dhama in P.M. yields 1000 times the benefit. 1. Lord Sri Krsna: “Purusottama month has all the power I have to bless its observer. One who follows Purusottama vrata will destroy all his past sinful reactions. Without performing Purusottama vrata, one cannot perform pure devotional service. The value of Purusottama month is far more valuable than all other types of austerities and religious activities mentioned in the Vedas. Anyone who observes Purusottama vrata will return to my abode, Goloka, at the end of his life”. 2. Durvasa Muni: “Just by bathing in a holy river during Purusottama month, one becomes sinless. The glory of all other months is not equal to one-sixteenth of the glory of the Purusottama month. By bathing in a holy place, giving charity and chanting the Holy Name of Krsna during Purusottama month, all miseries are destroyed, one attains all kinds of perfection and fulfills all his desires”. 3. Valmiki Muni: “By observing Purusottama vrata, one attains more benefit than performing one hundred horse sacrifices. All holy places live within the body of a Purusottama month vrati. Anyone who faithfully performs Purusottama vrata will go to Goloka Vrndavana”. 4. Narada Muni: “Purusottama month is the best of all months, vratas and austerities. Just by faithfully hearing the glories of Purusottama month, one attains Krsna-bhakti and immediately nullifies his sinful reactions. One who performs Purusottama vrata properly will attain unlimited sukrti and go to the spiritual world”. 5. Naimisaranya Sages: “Merciful Purusottama month acts like a desire tree to fulfill a devotee’s desire”. 1. Keep celibacy for one month. (Sleep on the floor – optional). 2. Rise in brahma – muhurta time. 3. Chant Hare Krsna Mahamantra and meditate on Radha-Krsna’s rupa, guna, lila. Daily chant extra rounds: 24, 32, 64. 4. Daily offer ghee lamp to Radha-Krsna Deities or Picture. 33 lamps daily or at least 1 day in the month. 5. Daily aratika and parikrama of Tulasi Devi. 6. Daily mandira parikrama (4 times). 7. Daily offer Radha-Krsna Deities or Picture roses, lotus flowers and 100,000 Tulasi leaves (or as many as you can). 8. One should bathe everyday before sunrise in a holy place. (At least , three days in the month). 9. Daily read Srimad Bhagavatam – Radha-Krsna lila ; acaryas say it is a rule to daily read S.B. 10.14—Brahma stuti. 10. Daily chant Sri Jagannathastakam, Sri Cauragraganya – Purusastakam, Sri Nanda-Nandanastakam, Jaya Radha Madhava, and other Radha-Krsna bhajanas and prayers. 11. Take a vow to remain peaceful and truthful throughout the month. 13. Try your best to please Radha and Krsna by performing devotional austerities according to your abilities. Don’t break your vow in the middle of the month. 14. Eat on leaf plates sitting on the floor (optional). 15. No cutting of hair or nails (optional). 16. No cooking in oil or rubbing of oil on your body. 17. No eating or rubbing of mustard oil. 18. Diets: Best to eat once a day after sunset or noon the following diets: i) only milk ; ii) only fruits (no milk, no veg. ); iii)no grains (selected veg., fruits, nuts, milk); iv) selected foods (all categories as per caturmasya standards). 20. Acaryas say chant daily some japa of Kaundinya Muni’s mantra: govardhana dharam vande, gopalam gopa rupinam / gokulutsava ne isanam,govindam gopika priyam. “I worship the lifter of Govardhana Hill, Who has the beautiful form of a cowherd boy, and who continually plays with the gopas. He is the Lord of Gokula wherein everyday is a festival. 21. Daily offer 33 dandavats to Bhagavan Sri Krsna or the vaisnavas. 22. Bhaktivinoda Thakura’s P.M. vrata: Perform the Nirapeksa Vrata, which means 30 days of concentrated, one–pointed worship and service to Radha-Govinda Yugala by hearing, chanting, remembering Their divine names, forms, qualities, pastimes. All day and night, hear about Bhagavan Sri Krsna, chant the Hare Krsna Mahamantra, take mahaprasada. 23. Charity: Best days — Ekadasi, Dvadasi, Purnima, Amavasya, Sravana Naksatra Day; DO offer money, gold, cloth, shoes, fruits, etc. to brahmanas and vaisnavas ; Also offer 33 plantains or mangoes plus dana and daksina —when giving dana (diff. items) to a brahmana, one must simultaneously donate daksina (money equal to the monetary value of the dana). O Lord Hari ! I offer my obeisances unto you. May you and your beloved Radhika, please accept my offerings. I offer my repeated obeisances unto Syamasundara, who wears effulgent yellow garments on His beautiful body. 2. Offer puspanjali and obeisances to Radha-Syamasundara Deities or Picture. 3. Feed and give charity to 3, 5, 7, 9, 11 brahmanas to the best of your ability (e.g., new clothes, two pairs of shoes, Laksmi). The best charity is to give a Srimad Bhagavatam to a qualified grhastha vaisnava brahmana. This act will deliver all your ancestors to the spiritual world and award them the association of Lord Purusottama! 1. If you ate fruits, ghee, rice, wheat etc, donate the same to brahmanas. 2. If you slept on the floor, give a bed and pillows to a brahmana. 3. If you ate on a leaf plate, feed brahmanas with ghee and sugar. 4. If you didn’t cut nails or hair, donate a mirror to a brahmana. 5. If you offered ghee lamps, give new lamps and pots to a brahmana. 6. * If you broke any rules or regulations during Purusottama vrata, feed different sweet juices to brahmanas. 7. Lord Siva says that the best charity is: “Fill a bell metal pot with thirty malpuas, bind the pot with seven new threads and give to a worthy brahmana”.